The city of Irkutsk (centre left) and part of Lake Baikal (right) are pictured in this Sentinel-1A image over Russia's Siberia region. Baikal is the largest lake by volume in the world, containing over 23 000 cubic km of freshwater, and is considered to be the oldest lake in the world. It sits in the Baikal Rift Zone where Earth's crust is pulling apart. Hot springs are found under and around the lake. The area has over 1000 species of plants and 2500 species of animals. More than 80% of the animals found here are endemic. Located on the Angara River, Irkutsk is a popular stop on the Trans-Siberian railway because of its vicinity to Lake Baikal. 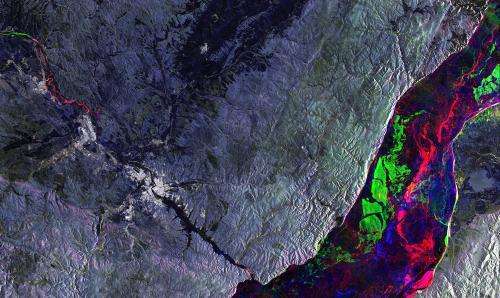 Sentinel-1A marks one year in orbit today, 3 April. It is the first satellite for Europe's Copernicus environment monitoring programme, delivering information on Earth's oceans, ice and changing lands. The data from the satellite benefit a variety of services related to, for example, the monitoring of Arctic sea-ice extent, routine sea-ice mapping, surveillance of the marine environment, monitoring land-surface for motion risks, mapping for forest, water and soil management, and mapping to support humanitarian aid and crisis situations.